UPDATE: Congratulations to Mike and Daniella! You’ve both won a pair of tickets to see Yo Gabba Gabba LIVE! on September 12th. Thanks to everyone who entered. There’s a party spreading across North America and it’s gearing up to hit Vancouver this September. 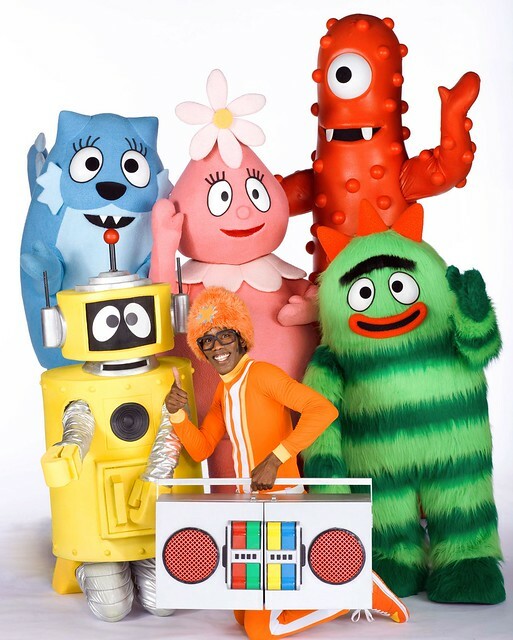 The Emmy-nominated, chart-topping Yo Gabba Gabba has taken its hit show from the screen to the stage as DJ Lance Rock, Muno, Foofa, Brobee, Toodee and Plex are making 60 stops from coast to coast. They’ll be visiting the Queen Elizabeth Theatre on September 11 and 12, 2010. Yo Gabba Gabba has rapidly gained popularity with kids, adults and big kids alike with its retro throwbacks, fresh jams and inviting entertainment. A dance floor full of celebrity guests have been a part of Yo Gabba Gabba at one time or another, including Jack Black, Andy Samberg, Tony Hawk and The Roots. 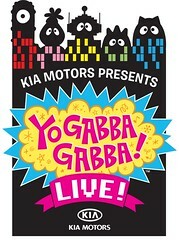 Partnering with Child Find and proudly sponsored by Kia Motors, Yo Gabba Gabba Live: There’s A Party In My City! promises to be a fun-filled, family-friendly show with music, singing, dancing, animation – and even a few special guests. Biz Markie (best known for his appearances on a slew of Beastie Boys’ records) will be on hand to help you all with your beat boxing skills in an entirely interactive experience. I’ve got tickets to give away to the September 12th show at 1:00 p.m. There will be two contest winners; each winner will receive two tickets. There are three ways to enter – complete all three and you’ve got three chances to win! Good luck! The contest closes at 12:00 p.m. on Friday, September 3 with the winners to be announced shortly thereafter. Yo Gabba Gabba Live! There’s A Party In My City will be donating $1 from all ticket sales to Child Find in the Greater Vancouver area. To purchase tickets, please visit Ticketmaster. Davis and I would take Foster to see Yo Gabba Gabba and he would probably have no idea what any of it was but might like to watch the colours bob around on stage! Our family has tickets already lined up (of course!) but we would love to bring our 3-year-old’s preschool friends along if we scored some extras. I’ve posted this to facebook and twitter too. Great contest Keira!! I would bring Ocean to see Yo Gabba Gabba and we would probably dance in the aisles and sing. Also, I have posted the contest on my facebook page. My son Cillian would love this! Penny LOVES! She wants to take her mom and her BFF Sonia (and her momma too) WOOHOO! Gotta go, there’s a party in her pants! Aghh!! This is such a random thing for YOU to be giving away – I love it! I of course, have learned about the amazing YO GABBA GABBA from my little friend Penny who just recently had her first birthday. It is her (moms) favorite show on treehouse, and it is awesome! We would be ecstatic if we won tickets to see them! I also posted this link on my facebook! I would take my 4 year old munchkin, Kaya! Also posted to my facebook! Hope I win…my little girl asked me if we could go on an adventure…maybe this will be it! I would LOVE to take my 5 year old son Brian as well as his two cousins! Brian just loooooooves going to live shows (Has been to Disney on Ice, and The Wiggles). If I won I would take my best friend because she LOVES Yo Gabba Gabba and would probably never buy tickets herself to go so it would be a nice surprise! I would take my little sister because I know she would just have so much fun! I would take my nephew. He loves it! I would love love to take my two year old nephew to this, hes a huge Yo Gabba Gabba fan! This is awesome. Yo Gabba Gabba is literally the best. I would really love to take my son aged 4, and my daughters, aged 7 and 11 even love Yo Gabba Gabba. Love DJ Lance! I would love to bring my son to see Yo Gabba Gabba Live! He’s wearing his Muno shirt right now! I would love to take my 3 year old daughter she will be turning 4 on the 17th so this would be the most amazing bday gif t for her! One of her favourite songs is “theres a party in my tummy, yummy yummy yummy yummy! its gotten us through many tough meals! I would love to take my special needs daughter. This is her favourite show!